The slugger's body has been breaking down for a while and the torn left biceps tendon is latest example of evidence of that. Detroit — This is not the end of Miguel Cabrera as an effective player, not according to the doctors, not according to the team’s plans, not according to Cabrera himself. Even as they spoke in subdued tones, that was the encouraging part. But the harsh truth is, it’s probably the end of Cabrera as we once knew him, a legendary hitter, the indomitable bulk of a franchise. It’s an ending that was hard to watch, but unfortunately, you could see it coming. Cabrera’s body had been breaking down for a while, and with every twinge and wince, the toll was mounting. Now the cost is huge for Cabrera, out for the season with a torn left biceps tendon. As he sat at his locker Wednesday, a black brace clamped on his left arm, he spoke in a low tone and used the word “shocked’ several times. The cost is prohibitive for the Tigers too, who still owe Cabrera at least $154 million the next five seasons. This doesn’t have to be about the contract, which looks awful but was never going to look good since the day Mike Ilitch offered the eight-year extension in 2014. This should be about the player and the challenge ahead because the money is committed regardless, and was always going to be paid for past performance. It will be an enormous challenge. Cabrera will undergo surgery in New York Thursday, and the hope is he can resume baseball activities in six months and be ready by spring training. That’s only a hope. This is a rare injury for a baseball player — more common in football and weight-lifting — and there aren’t many established timetables. “I don’t know,” Cabrera said again and again, and he wasn’t being evasive. Nobody really knows how his 35-year-old body will respond, especially after the latest breakdown, which was pretty much a fluke. He came into spring training in excellent shape but couldn’t stay healthy. He has played through many injuries, sometimes admirably, sometimes irrationally, but finally admitted he could do it no more. He hurt himself one more time with a big swing in the third inning against the Twins Tuesday night, and the severity was obvious immediately. Cabrera rarely surrenders to pain, but this time, he dropped his bat, grabbed his left arm and strode quickly into the clubhouse. After an MRI revealed the rupture, the team’s head athletic trainer, Doug Teter, delivered the news to Cabrera. Great question, for the Tigers and their four-time batting champ, Triple Crown winner and future Hall-of-Famer. In another time, before the team launched its rebuild, this would be competitively devastating. It’s certainly personally devastating for Cabrera, whose numbers had declined, but as recently as 2016, he hit .316 with 38 home runs. This season, his power was drained and he missed 30 games but still was hitting .299. 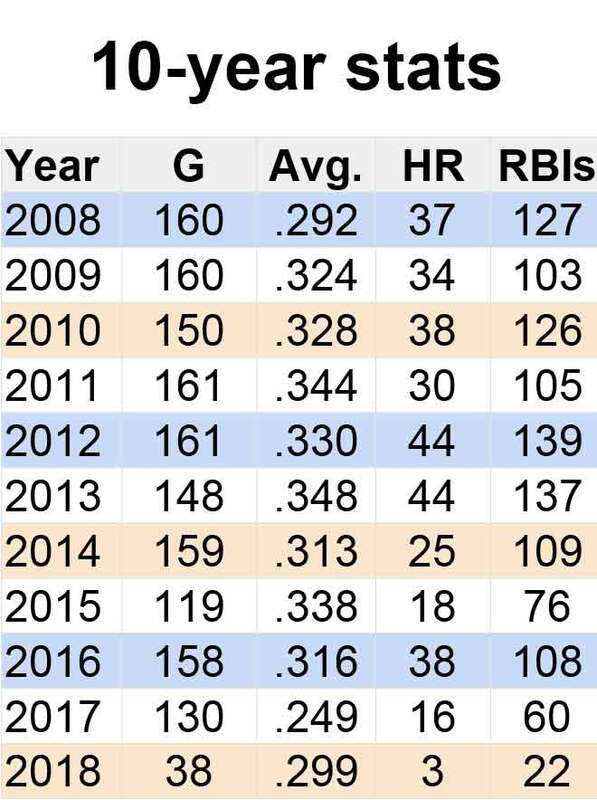 Consider him done as a productive hitter at your own peril, just as some mistakenly once considered Justin Verlander done. Because of Cabrera’s size — although he lost weight the past few years — this is more daunting. Certainly, it’s time for him to move from first base to designated hitter, with Victor Martinez gone next season. In other subtle ways, this could hasten the rebuild. More will be required of Nick Castellanos, who already was assuming a much larger role, and rising young players such as Jeimer Candelario. There was an inevitability about this, even though Cabrera didn’t land on the disabled list once until 2015. Since then, the scope of his ailments traveled the length of his body, from a fractured foot to an ankle injury to a calf strain to a groin strain to back problems to a persistent hamstring issue to a biceps strain that first occurred six weeks ago. The void is large, but the Tigers (31-37) have been preparing for the makeover for a while. Castellanos, 26, was preparing for it during spring training, knowing he was about to become a face and a force in the absence of veteran stars. Castellanos has responded with his bat and his voice, and in the aftermath of the news, was respectful of his fallen teammate and mindful of what was next. To illustrate the point, Gardenhire entered the quiet clubhouse and told the team to get ready for the next game, not to dwell on the injury. Then he suggested someone break the silence and turn up the music, and Castellanos obliged. The volume will be turned up now on the talk of Cabrera’s future. Teter said it’s hard to pinpoint the prognosis because the procedure usually is performed on 40-50-year-olds, not on major-leaguers. Cabrera said he plans to go through rehab in Detroit to stay connected to the team. He tried to sound positive, but less than 24 hours after his bicep popped, it was difficult. He knows he won’t feel like himself for a while. Whether he’ll ever play like himself again is the great unknown.